Would you like a fancy meal from a world-renowned chef while at Yester California Adventure? Did you bring a credit card? 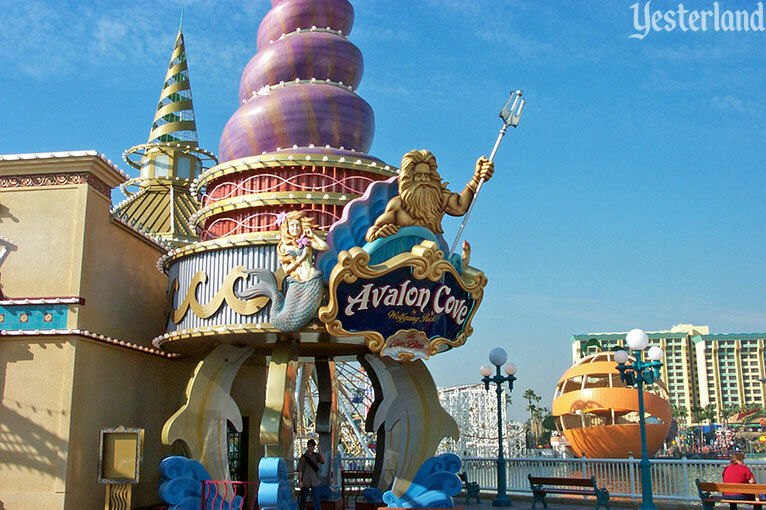 The Avalon Cove restaurant is at the entrance to the park’s Paradise Pier section. 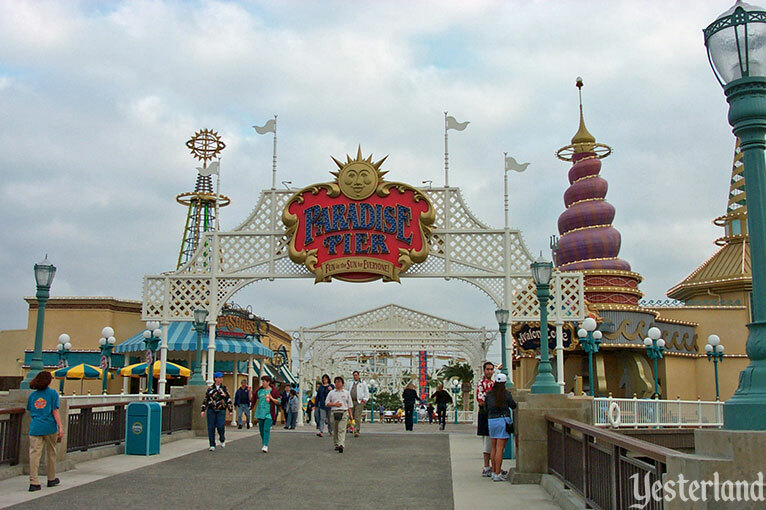 Although Paradise Pier is supposed to conjure up images of long-gone California seaside amusement parks such as Ocean Park Pier in Venice and The Pike in Long Beach, those parks never offered such a fine dining experience. This is not an ordinary theme park restaurant. Avalon Cove is operated by Wolfgang Puck, chef to Hollywood’s rich and famous celebrities—and quite a celebrity himself. Puck—creator of Ma Maison in West Hollywood, Spago in West Hollywood, Spago in Beverly Hills, Chinois on Main in Santa Monica, and Granita in Malibu—is credited with defining and popularizing California cuisine and Asian fusion cuisine, and for inventing gourmet pizza. Sure, Wolfgang Puck lends his name to airport eateries and frozen pizza. However, Avalon Cove is a real, one-of-a-kind restaurant for those who appreciate creatively prepared, beautifully presented meals made from the finest, freshest California ingredients. Nothing says California cuisine like Avalon Cove by Wolfgang Puck, where you can feast on a magnificent selection of fresh fish, steak and other gourmet specialties, while overlooking Paradise Bay, the pier and the rocky coastline. 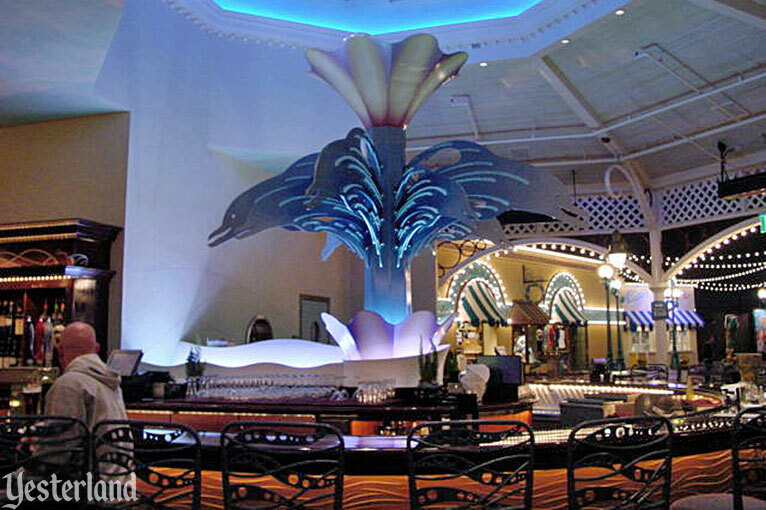 The Cove Bar, located on the restaurant’s upper level, features spirits and ale, and a fresh sushi bar. At the 350-seat Avalon Cove restaurant, choose between indoor and outdoor seating. 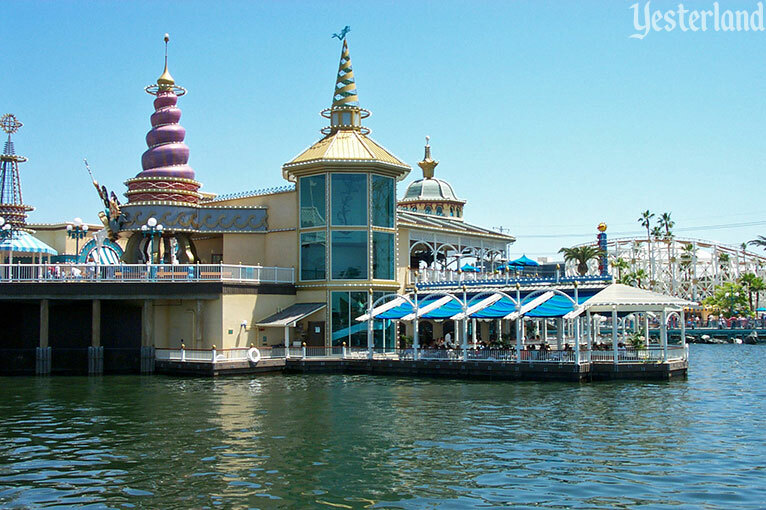 The restaurant’s private pier extends into Paradise Bay. There’s usually a pleasant breeze. A canvas canopy protects you from direct sun. 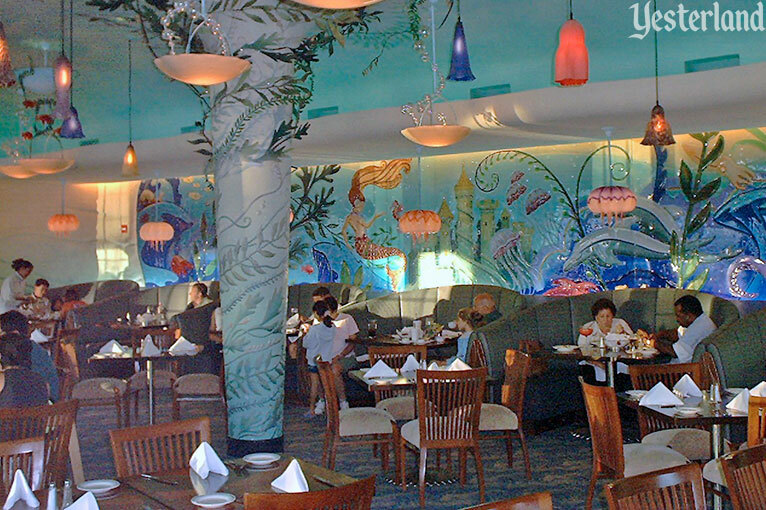 The interior features a fanciful undersea decor, with hand-made lighting fixtures and a costly Italian glass mural. How about a leisurely four-course meal with fine wine? Perhaps a different wine with each course? This theme park isn’t “dry” like that other theme park across the Esplanade. It’s the kind of menu that causes diners to ask “What’s cucumber raiita?” and “What’s citrus mignonette?” But that’s okay. Go ahead and ask. Try the tuna sashimi appetizer and mahi mahi with wasabi potato puree. Or play it safe with a shrimp cocktail and a steak. Avalon White Clam Chowder with applewood smoked bacon and fingerling potatoes, $5.00. It’s not cheap, but it’s not out-of-line for what you get. 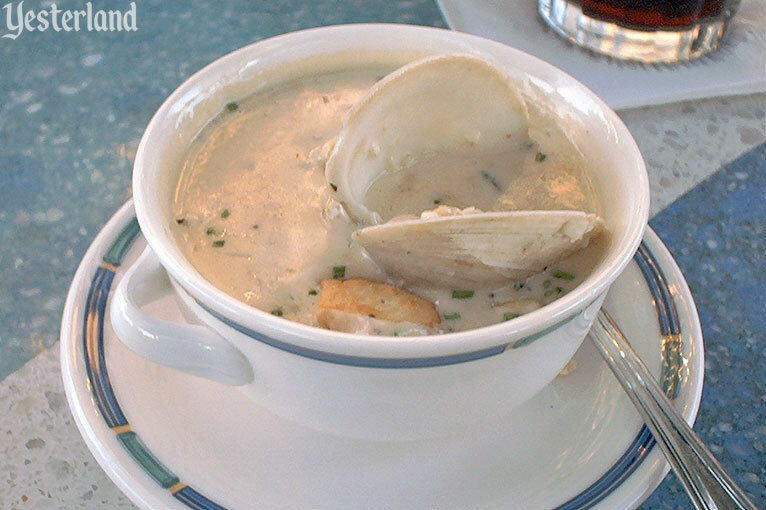 And, if you think about it, the superb Avalon White Clam Chowder for five dollars may actually be a better value than a five-dollar corn dog elsewhere at Paradise Pier. The view from outdoor tables is spectacular, especially at night. 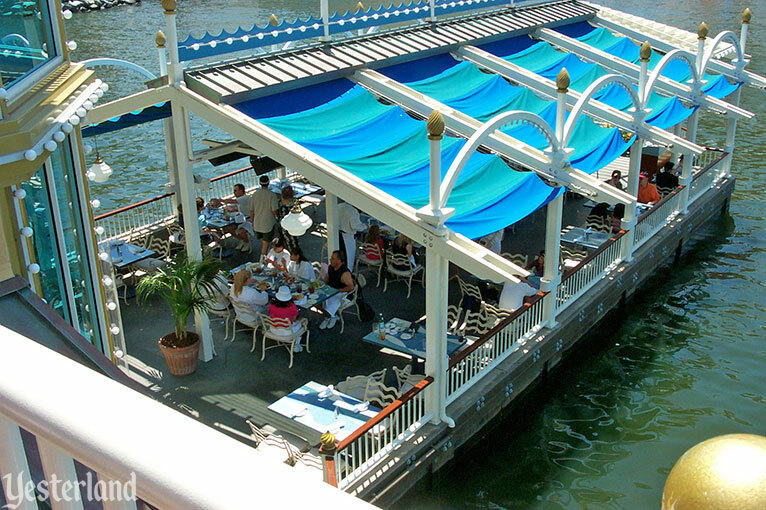 It’s easy to get a table at Avalon Cove. You don’t need a reservation, which is unusual for a restaurant of this caliber. Maybe there aren’t enough people around here who want to spend $43 for park admission and then another $100 or so for dinner, wine, tax, and tip. If you’re not up for a big dinner, consider having a drink and some of Wolfgang Puck’s bar food at The Cove Bar, the full bar upstairs. At night, The Cove Bar is spectacular. There are plenty of seats, and most of them are empty. 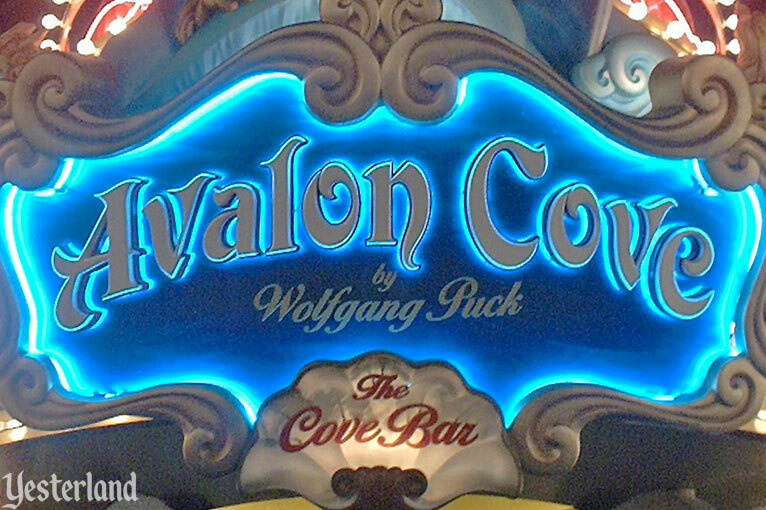 Avalon Cove by Wolfgang Puck opened along with the rest of Disney’s California Adventure in February 2001. But it didn’t last long. At the beginning of October of the same year, Wolfgang Puck gave up on his ambitious, upscale seafood eatery. Avalon Cove must have seemed like a good idea before it opened. How could Avalon Cove miss? The big crowds who would fill Disney’s California Adventure would jump at the chance to dine at an excellent restaurant from the legendary Wolfgang Puck. 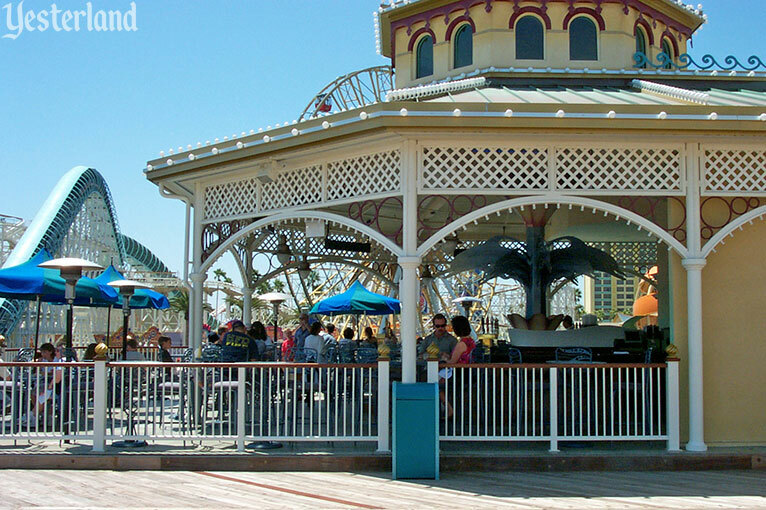 The business model of fine dining within a theme park worked well in Florida. Most table-service restaurants at Epcot were full every night. In fact, the restaurants were among the biggest attractions at Epcot. Guests bought admission tickets for Epcot just so that they could dine there, and they ran up big lunch and dinner checks enjoying multi-course meals and fine wines. 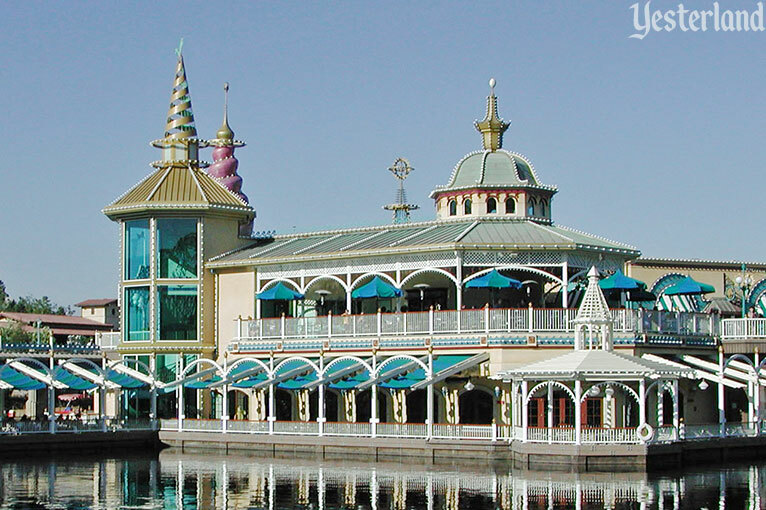 Some Epcot restaurants were Disney operations, while others were run by outside restaurateurs. The problem was not Avalon Cove itself. It was in the wrong place. 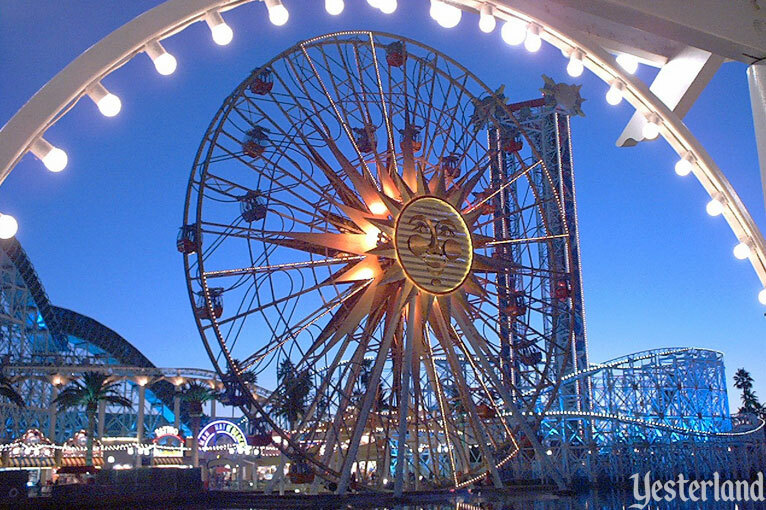 The big crowds never materialized at Disney’s California Adventure. The restaurants at EPCOT Center (now Epcot) were instantly successful with Orlando locals and out-of-town guests when the park opened in 1982. For one thing, there weren’t too many other choices in the area at the time. But Southern Californians and out-of-town Disneyland guests in 2001 had no shortage of other choices. And while EPCOT Center opened with a full roster of compelling attractions, the decision makers for Disney’s California Adventure were unsuccessful in producing a park that would pull in crowds. After September 11, the already abysmal numbers dropped even further. 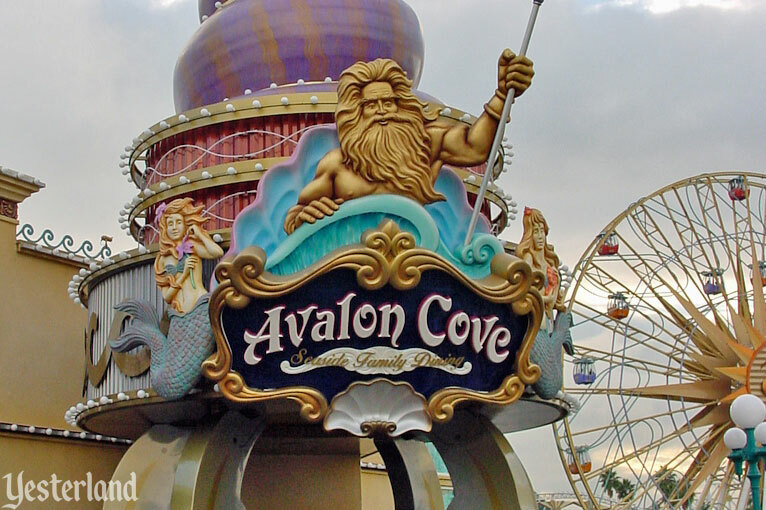 Avalon Cove reopened a few months later as a Disney-operated character-dining restaurant for families. 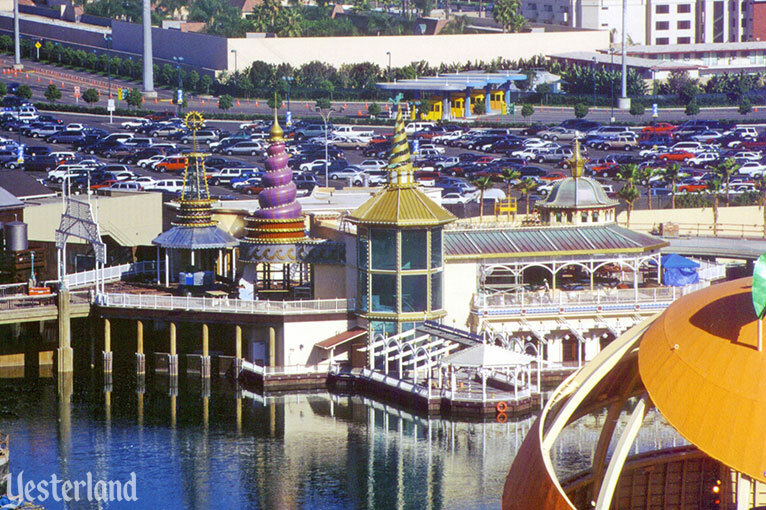 Avalon Cove wasn’t the only failed high-end restaurant at Disney’s California Adventure. At the same time that Wolfgang Puck closed his Avalon Cove, Robert Mondavi Corp. ended its operation of the Golden Vine Winery restaurant. The change wasn’t as visible because Mondavi stayed on as a sponsor after Disney took over. A year later, the Avalon Cove name disappeared from the main sign. 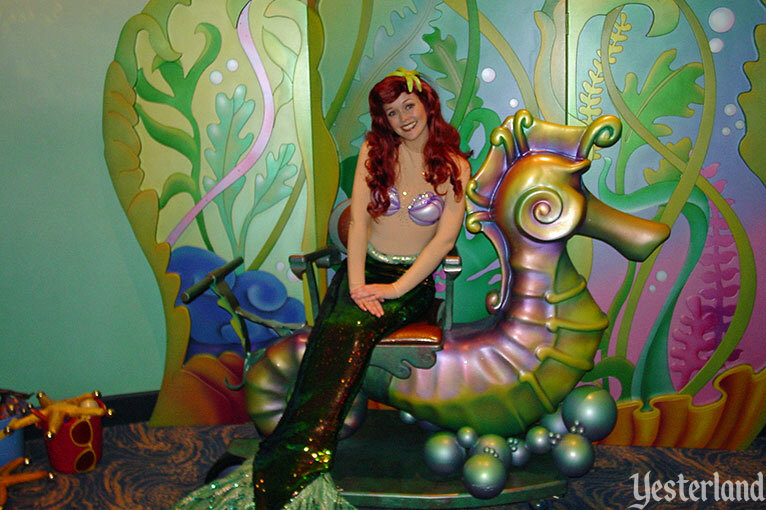 At “Ariel’s Grotto - Disney Princess Celebration,” mermaid Ariel was joined by other Disney princesses, including Belle, Snow White, Cinderella, and Aurora. The menu offered comfort food dishes such as Chicken & Biscuit Pot Pie and Maliboomer Meatloaf. There was still some seafood—Paradise Bay Fish & Chips, Surf’n’Salmon B.L.T. and Bayside Shrimp Cobb Salad—but nobody mistook Ariel’s Grotto for a fine seafood restaurant. The draw became character interaction, not cuisine for foodies. Wolfgang Puck’s failed restaurant is only a memory, but the building itself hasn’t changed much. As the two pictures above show, the building is now white with a red roof. 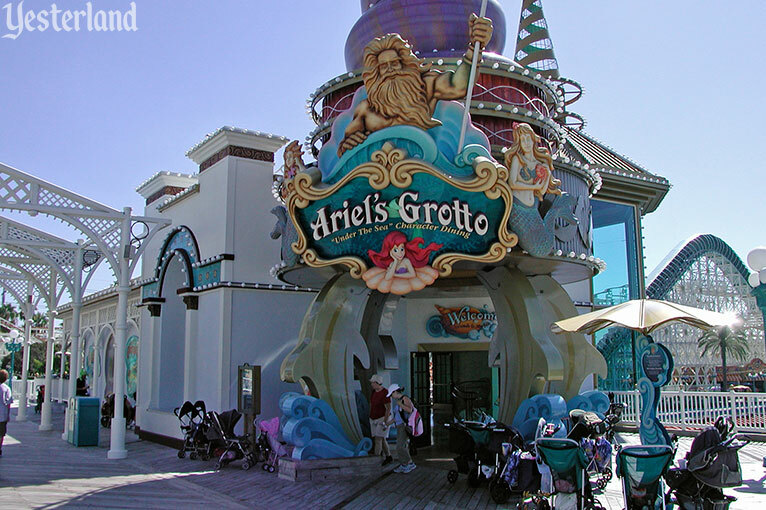 Ariel’s Grotto still takes advantage of the expensively outfitted interior of Avalon Cove. 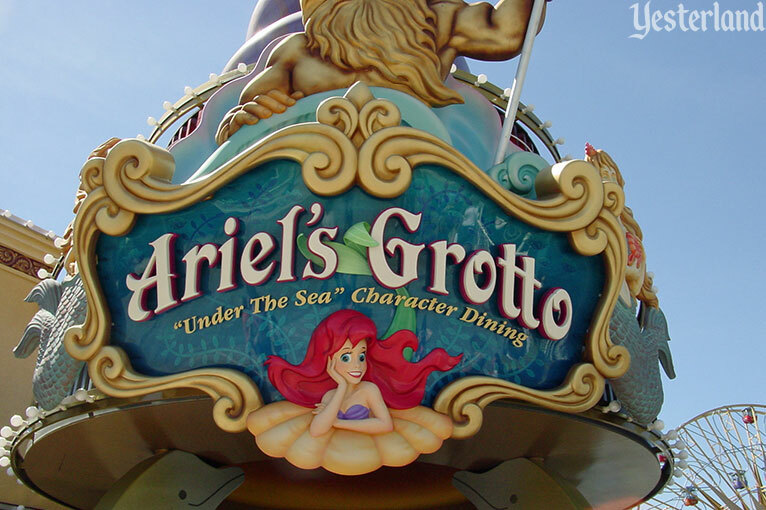 When World of Color opened in 2010, Ariel’s Grotto switched to character meals at breakfast and lunch only. At dinner, Ariel’s Grotto offered a prix fixe package which included access to a preferred viewing area for World of Color. And that’s still how it is today. Fine dining returned to Disney California Adventure in June 2012 with the opening of the Carthay Circle Restaurant. The Cove Bar is still called The Cove Bar. 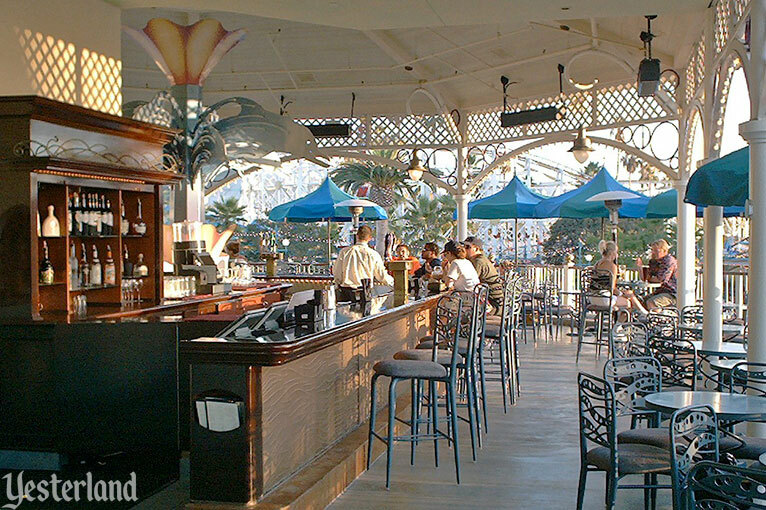 It makes sense that it wasn’t renamed “Teenage Princess Ariel’s Full-Service Bar.” The Cove Bar still offers spectacular views, but, alas, the bar food is no longer from the kitchen of Wolfgang Puck. Thank you to the Photographers! 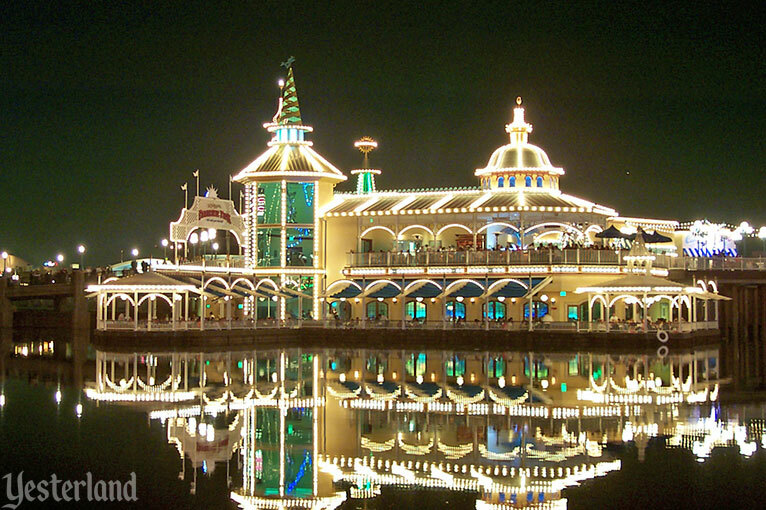 Allen Huffman has provided hundreds of photos to Yesterland from his DisneyFans.com website. 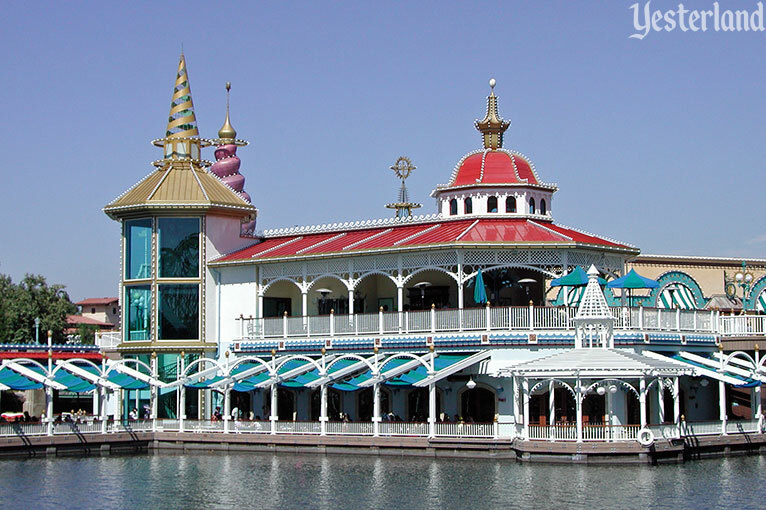 Tony “WisebearAZ” Moore took thousands of photos of DCA under construction and during its early years for his now-defunct website, DCA Central. Kevin Yee is an author, blogger at UltimateOrlando.com, and longtime MiceAge/MiceChat columnist.